Social media: Websites used primarily for socializing with friends and family. Facebook is the most successful example of this. Social networking: Socializing for a personal or professional purpose or benefit. LinkedIn is an example of professional social networking. Social collaboration: Socializing to achieve a common goal. Websites such as Yammer are considered social collaboration sites because they offer colleagues the tools to collaborate in an online social environment. To create, manage, or improve a social collaboration system, it helps to understand how social networking and social collaboration are different as well as how they come together. Collaboration tends to be more focused than social networking, meaning that it’s associated with a specific project and involves a smaller number of people. To achieve their goals, team members share digital assets, such as documents and project schedules. If the goal of the project is to create a document — say, a proposal — the online collaborative experience may revolve around exchanging drafts of the document or working on it in an environment that allows synchronous editing. Or, the digital assets may be planning tools used to coordinate work that occurs offline. The point of collaboration is to get work done efficiently, whereas social networking focuses on making connections, not necessarily in the context of an immediate project. In the offline world, two employees sitting together at the same desk, working together intensively on a common problem, are collaborating. Two people who run into each other in the hall and learn and casually exchange information about their respective projects are networking. You might interact with the same person in both modes on the same day, collaborating in the morning and networking in the evening. Offline social networks within business consist of the connections between people who work together, as well as the more extended connections between employees who run into each other in the hallway or tell jokes at the water cooler. Online social networking is a digital representation of the networks that exist between people and an aid to expanding those networks. In addition to connecting you with people you know, they allow you to discover people you would like to get to know. In a business context, this means keeping tabs on people who have expertise or authority relevant to your work. Adding them to your database of contacts makes it easier to keep track of them. Meanwhile, the social nature of the environment makes it easier to connect names with faces, navigate to a person’s profile with a click, and monitor posts or other activity updates from our contacts. The following figure shows the NewsGator social profile for Jenay Sellers, an online marketing manager for the software vendor. Her profile makes it easy to see the topics she posts about most frequently (based on tags used in those posts), which is a clue to interests or expertise. You can also see who else follows her posts, and other tabs on her profile would allow you to see colleagues in her network and content she has posted. 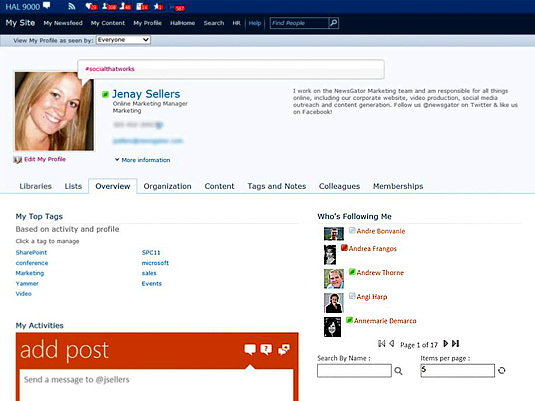 A NewsGator social profile lets you see a colleague’s connections, as well as the subjects she posts about frequently. Part of the theory of why social networking is so powerful lies in the strength of weak ties: that is, more casual connections, as opposed to strong ties with close friends or co-workers you know better. For example, if you lose your job, having a large network of connections on LinkedIn (and in your offline social networks) significantly boosts your chances of coming up with a lead on a new opportunity, even if those connections might be weak ties. Better yet, if you can persuade your connections to share the news of your availability with their own networks, you’re getting exposure to people with whom you previously had no tie at all. Of course, after you land an interview and are trying to seal the deal, your tighter connections are the ones you will turn to for a recommendation. In the same way, when you have a problem to solve at work or a question you need answered, the answer may come from a weak tie connection or even a connection a few degrees removed. Social networking can naturally lead to social collaboration. Over time, these new connections may become strong ties, or at least stronger ones, if you find they consistently have the answers you need for your work. Someone who starts out as a social connection may also become a collaborator. If someone has been consistently helpful, maybe you can return the favor by recommending that colleague for a choice project.